The California High School Exit Exam was required for graduation after 2006. Certificate of Achievement awarded to Prospect High student Arlene Holmes instead of diploma because she didn’t pass the California High School Exit Exam. 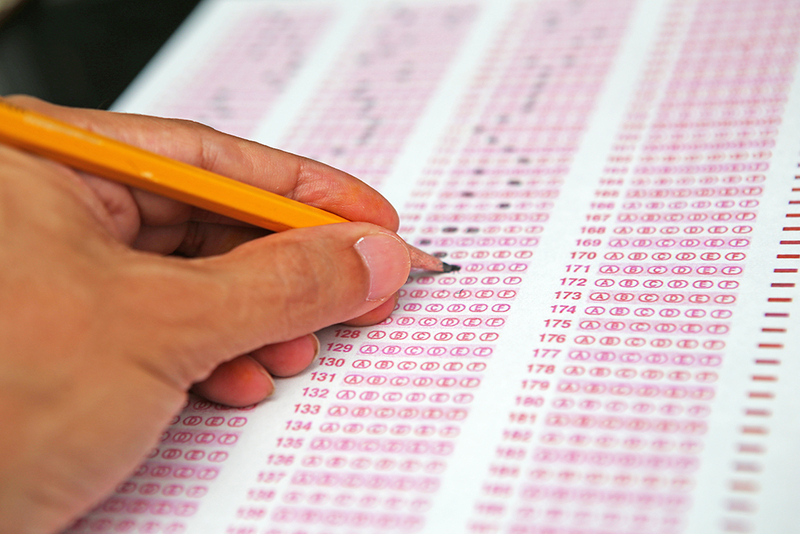 The test was first administered to freshman students in 2001, and they were required to pass it before they graduated in 2004. By 2002, only four in 10 students from the class of 2004 had passed the test, prompting lawmakers to postpone it as a graduation requirement another two years. About 91 percent of students in the class of 2006 passed by the end of their senior year, including 67 percent who passed on their first try as sophomores. 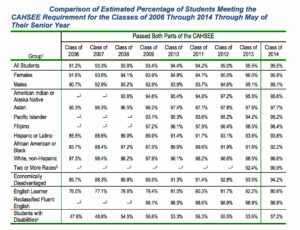 By 2014, about 95.5 percent of seniors passed, including 90 percent who passed on their first try as sophomores. 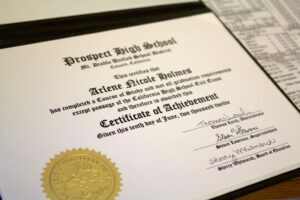 Arlene Holmes received her certificate of completion in 2012 from Prospect High School in Pleasant Hill in Contra Costa County. Holmes easily passed the English portion, she said. But the math proved too difficult. Arlene Holmes has been denied jobs and entrance into some training programs because she has not yet passed the CA High School Exit Exam. “It is ridiculous how I actually worked extremely hard to even finish high school back in 2012,” she said. Holmes, now 21, said not earning a diploma prevented her from enrolling in a vocational nursing program and other trade schools. So does this mean that the people that didn’t receive their diplomas can get it? I passed all my requirements for school but didn’t pass the exam? It’s a great thing that this CAHSEE Test will be done away with! I believe it was unfair exam! There moto was “No kids left behind” Liar!!! my daughter was left behind and not proper perpare. when she took CAHSEE 2006, at Rancho Cucamonga High School, she had all IP classes, attended summer school every year, she had more & above the number of credits to graduate from school, I her dad met with the counselor school principle we were given the run around business if you know what mean, their lack of actions was disappointing. The system has fail my daughter and many others have been held back from making having better life. It’s never acceptable let child fall throught the crack! they took an once in life time moment from my daughter who will never get back the opportunity to walk with her classmate to receive her diplomas. I thought this was so wrong & illegal how they treated us/my daughter, it’s been 9 years since this traumatizing experience. I believe a lawsuit should have been filed against school district. This needs to be rectify at the highest level. Please reach out to me and tell me how my daughter could file a petition to give her 2006 high school diploma. Thank you. We have in the last six years had to students who scored perfectly the first time. Last year all 10 th grade students passed both sections on their first try. I attribute this to trying harder to pass on the first try. During graduation ceremonies they are awarded $20.00 gift cards for each part passed ELA and math. Our school has 90 per cent low income families and we have a majority of Latinos. We need to stop making issues about race and income and start teaching and motivating students to learn . That should not be hard to ensure when there were only 9 students enrolled in 2014-15 (7 in 2013-14, 12 in 2012-14, 14 in 2011-12). Or so says DataQuest. The recent passage of SB 725 grants exemption of the CAHSEE requirement for 12th grade high school student who have meet all their course requirements in 2015, this was passed because the State did not provide the CAHSEE test in July 2015. I have been inform that this exemption will not be avaiable for Adult school students and only applies to high school students, which was told to me by an Adult school and Ca Cahsee dept. The issue that I see is it is discrimination against Adult Ed high school students, since both regular high school student and Adult Ed high school students are required to pass CAHSEE for the same Diploma. The test was unavailable to both groups in July 2015 and will continue to be unavailable for the posted Oct 2015 test date. The 14th Amendment and the CA Declarations of Rights grants equal protection. CA Constitution article 1 sec 7 , 2b reads(b) A citizen or class of citizens may not be granted privileges or immunities not granted on the same terms to all citizens. Accordingly SB 725 grants a privllege to 2015 High School student which it denies to 2015 Adult Ed high school students. The legistature has SB 172 ( suspending the CAHSEE Test) it is in process, but I have been told that it may not make it out in time, If it were to pass, it would still leave Adult Ed student in limbo till Jan 2016 to get a high school diploma. Nevertheless I urge you to call your legislators to urge a quick passing of SB172 this year, to help ALL Students who are being deprived of an equal exemption under SB725, which was a result of the State of California DEPT of Education’s FAILURE to provide the required testing. I would actually rather hear from freshman college professors of 4 year and junior colleges about what their opinions are on indicators of “college readiness”. Useless for improving instruction. I am a retired school district super of the 1960’s ITBS era, it served us well in modifying instruction at all levels. School business in California in those days wasn’t concerned for identifying an exit score for masses of 12th graders. Does the CAHSEE score received by a student demonstrates that s/he has the academic preparation required to graduate from high school? While all my children did pass this test and have been successful in college, I have my doubts based on one single point of evidence: an LAUSD valedictorian could not pass the CAHSEE. The name of this student has been shrouded in secrecy, but I was told by a person that knew the particulars of this case that it truly did happen. Reasoning that CAHSEE scores should be reflected on the relationship between classroom grades and CST scores, she commissioned a simple study of that relationship. After examination of plots of the 2007-08 and 2008-09 scores of students against their classroom marks, Dr. Elliott conclude that there was simultaneous grade inflation and deflation across LAUSD. How else could it be explained that, for example, 43% of 8th graders getting “A” in English at LAUSD middle schools were not proficient while 39% of those getting “A” in math were also not proficient? In addition, 40% of 8th graders getting “F” in English were “proficient or above” while only 22% “F” students were also “proficient or above” in English. It boggles the mind because it is against common sense, doesn’t it? Hence, LAUSD had to take a hard look at how grades are being granted across the 100 middle schools and 80 high schools because, again, everybody knows that the CST scores should reflect the student’s classroom mark. In the end, not much came from this task force. What did come out was a “homework” policy to increase the likelihood that there would be a paper-trail that could lead to understand how a student could get an “A” and still not be proficient in the CSTs which surely meant that the student could not pass the CAHSEE. I’ll leave you to ponder on who was going to be left holding the bag under this scenario. Unfortunately, the homework policy blew up on Ms. Elliott’s face. John Deasy, the new Superintendent, asked her to look for better opportunities elsewhere. 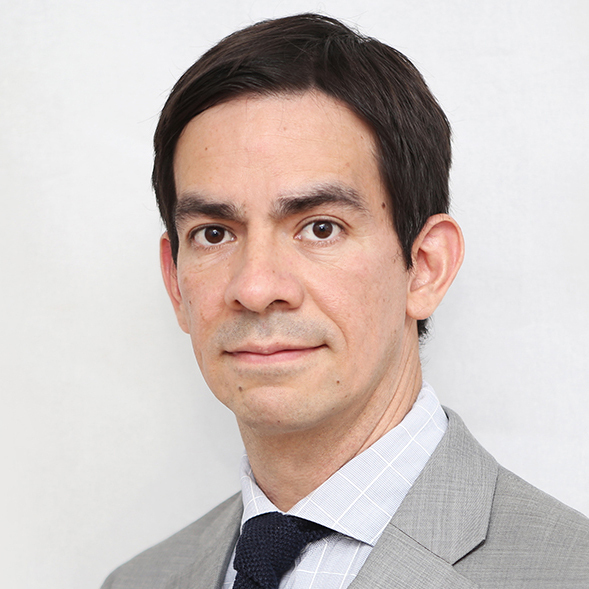 He had just installed Jaime Aquino, Ed.D., as her supervisor so the time was ripe for that. Yes, it sounds like a Homeric tale: a single student, a valedictorian no less, can’t pass the CAHSEE and as a result LAUSD determines that there is grade inflation and deflation simultaneously because the grades don’t correlate with CST scores across the entire district (we are talking about 300,000+ students here). Something must be done but nothing happens because the interest of the new Superintendent is elsewhere (it was VAM, but that’s a story for another time). The true moral of the story is that it cannot be guaranteed in a district with 10% of the state’s students that a student’s academic achievement in the classroom will be reflected on the results of the CSTs or the CAHSEE, their cousin once removed. In the case of the CAHSEE, it is test designed to convince California that the kid learned something in high school. But it is really a probability statement, which is no better than a coin flip. You win half the time, half the time you lose. If the CAHSEE functioned to foster more rigor that might be one reason to reinstate it. But since it is a low bar for rigor to begin with, the two ideas don’t really make sense. In the real world, what opportunities does a high school diploma offer? Mostly low level ones. So why do we as a society need to make sure our high school graduates are qualified to do low level work? Employers, community colleges and trade schools can make those determinations on an individual basis. We don’t have an exam for the major in order to graduate from a 4 year college bachelor’s program where students, upon exit, are likely to have more responsibility entering the work force. In the late 1980’s there used to be a test of basic writing skills that students had to pass in order to earn a B.A. or B.S. at CSULA, and I thought at other Universities as well. Students had to write an essay or two. I guess that test is no longer in place? Thanks for this excellent article which is so informative and broadly illustrative of our divisive educational cross-currents. 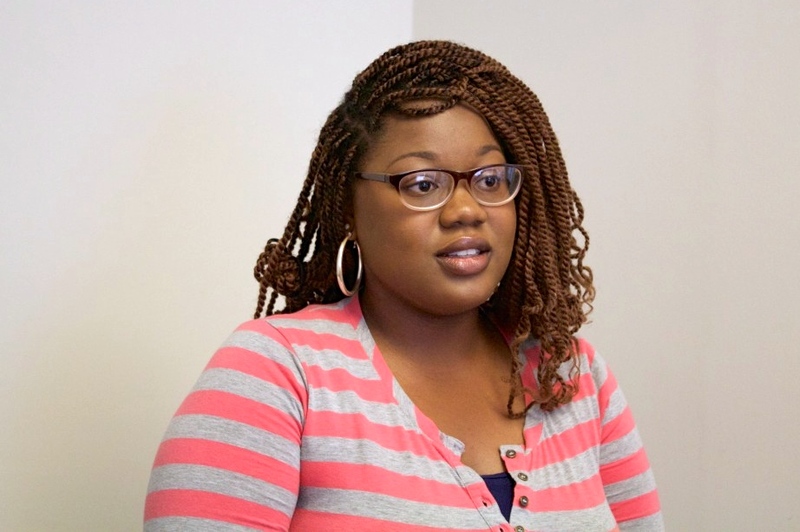 I was struck by arguments for getting rid of the CAHSEE (or devising a timely replacement version) because some low-achieving socio-economically impoverished students cannot pass it and thus are prevented from receiving a full high school diploma and thus are prevented from getting desirable jobs. Does this description say dump the exam? Or does it say provide better instruction and encouragement for those bottom-tier students to assure they can do the work, accomplish the task and pass a milestone toward a high school diploma? If we cannot update something as simple and straightforward as the eighth grade-level CAHSEE and commit to its value, why do we have any standards or graduation requirements at all? My understanding is that most accurate predictor of college readiness is firstly a student grades, not standardized tests. And, graduation requirement has always been maintaining a minimum grade point average; as well as a minimum standard of attendance. If these three things are true, then Jack O’Connell’s term “seat time” is inadequate because it doesn’t capture these other factors that were associated with graduation prior to an exit examine. This article mentioned examples of the exit examination being a barrier to students getting additional education. If that is true of one student, instead of thousands reported in the article, then I would still be 100% against reinstating the exit example and dropping a test standard that unnecessarily becomes a barrier to students seeking additional education. Performance in the classroom should be valued more than performance on a test. As noted by another commentator below I know of NO cases where students were awarded a diploma for “seat time,” that is just sitting in class and not participating in the assignments, quizzes tests, homework etc. This is little more than an urban myth, and pushed by those who have spent little to no time in an actual classroom. I do know of students who were denied access to a fully rounded curriculum, including electives where they might find inspiration to stay in school, because they were doubled up in extra class in ELA and math because of the CAHSEE requirement and because state tests were focused on those two content areas. I just don’t know what I think about this exam. I am so sympathetic to the students who wrote heartfelt (if also telling) comments about not being able to pass the exam and how that has limited their opportunities. I also – and this may be my character flaw – don’t fully understand why this test is such a barrier and am not wholly convinced that it is the only barrier. As a community member, I have seen very many students pass it on the first try. I am not sure that the issues are internal to the student; and if that’s so, it hurts to have the hammer fall on students, especially when they express motivation and effort. Colleges and others *could* choose to accept the certificate of completion. They choose not to. Withdrawing the exit exam deprives them of a choice there, but presumably those colleges have made a deliberate and thoughtful choice. I’m interested to hear from some of those institutions what they think. I don’t understand exactly the situation of special ed kids and where the line is there. This perhaps is the most persuasive argument that I’ve heard, that kids who are lower functioning and cannot pass the exam are getting full diplomas, and yet we apparently have young adults who have taken the exam, 6, 8 times and can’t pass it? It would be one thing if the student took it a couple of times and just didn’t put in effort to do well. It seems to me that a student who has made so many honest and frankly inconvenient attempts and is still not successful is probably someone who should have had an IEP. Thanks to EdSource and Fermin for a very balanced treatment of the issues surrounding CA’s HS exit exam. The issues are quite similar to HS exit exam discussions in other states. The primary drivers for CAHSEE back in 1999, as I recall, were reports of students with very little if any documentation of basic skills achievement, rather only attendance or seat time, receiving HS diplomas. The thought that CAHSEE could change instruction at the high schools in CA was very secondary. About 2 years after the CAHSEE statute was approved, the Co-Chair of the CAHSEE advisory committee [Supt, Glendale Unified, I believe] was asked a Q at a State Board meeting on the impact of CA’s 1997 standards on instruction in his district. His off-the-cuff answer was — a good deal of movement toward standards-based instruction at the elementary grades, some signs of progress at the middle school grades, and (well) at the high school grades it was like “trying to move a cemetery.” When CAHSEE turned fully operational in 2006, it had moved a number of tombstones for the instruction of basic academic skills needed for a high school diploma in California. 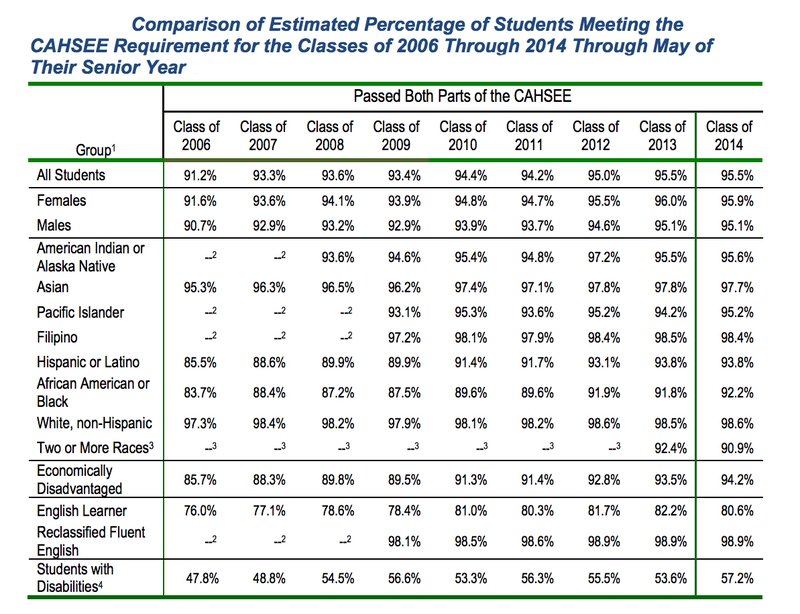 There are, of course, contending and contrasting opinions on the worth of CAHSEE over the past 10 to 15 years. These opinions and positions deserve a full legislative hearing before a HS exit exam program is continued or allowed to expire. SB 172 (Liu) suspends CAHSEE while theoretically that decision is studied — a suspension biases that study and decision, and is particularly poor policy if indeed an exit exam program is continued by the legislature. Oh, and it puts the recommendation for continuation or expiration solely in the hands of current SSPI Torlakson, sponsor for SB 172, with an advisory group he gets to appoint. Anyone wanna guess what that recommendation might be, coming from a source who has already clearly tipped his hand by prematurely canceling the July administration of CAHSEE despite current statute and an approved test administration budget for 2015-16?